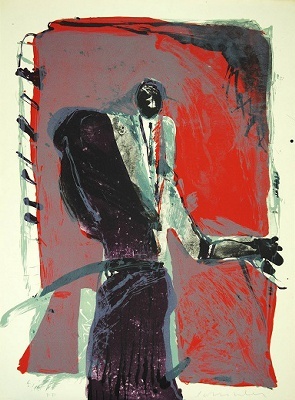 Title: "Indian With Feather Fan"
Fritz Scholder (October 6, 1937 – February 10, 2005) was a Native American artist. 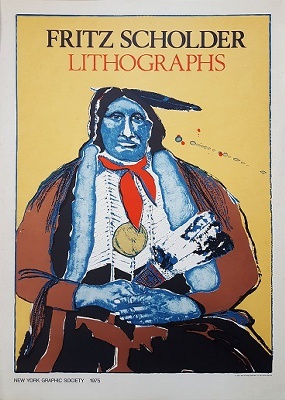 Born in Breckenridge, Minnesota, Scholder was Luiseño, a California Mission tribe. Scholder's most influential works were post-modern in sensibility and somewhat Pop Art in execution as he sought to deconstruct the mythos of the American Indian. 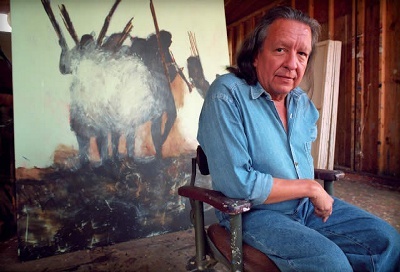 A teacher at the Institute of American Indian Arts in Santa Fe in the late 1960s, Scholder influenced a generation of Native American students.